Which ties in to one of our “chore chart” rules: “you only get paid for doing chores if you’ve done it without being told.” When we first started doing this, the kids loved it. They were getting paid every Saturday. But, then they started to not want to do the work anymore. They had money sitting there and they felt comfortable just ‘having’ money. Why should they work for more? haha. Well, doing the work for free quickly changed that attitude! The other rule we have about “chore chart” money is: You only get to spend half of it. 25% goes into savings, and 25% goes to charity. They can put more money into savings if they want, but, they don’t get to touch that money again until they’re 18. We had a pretty decent charity for them to donate to in Raleigh. Every Sunday, they’d give their money to a program through the church that helped buy meals for people that couldn’t get enough of their own groceries. Mary and I have spent a lot of time discussing charities. We both very much believe that we should help people that need it. But, I have enough cynicism in me to be very distrustful of most “charitable” organizations. (a little off topic, but we recently did some reading into the breast cancer pink ribbon program. It should have shocked us I suppose, but somehow it didn’t. Without getting too involved in that particular topic, I will say that before you spend money on a pink ribbon program, find out where the money goes. In most cases, it’s not where you’d think.) Anyway, our preferences are NOT to give money directly. And we also prefer not to give to large organizations. We’ve sponsored cottages at an orphanage for… three years? I think it’s been three. Now that we’re mobile, (and just now getting the chore chart going), I’m pretty sure that we’ll be visiting local battered women’s shelters, or orphanages close to us. It seems better if we can show up with a bag of groceries, instead of an envelope of money. People are less likely to skim off the top when you give them groceries. And corporate executives aren’t paying their limo drivers with creamed corn. So, even if we end up not making the best choice of WHO to give to, we have some control over how they can use our donations. So with handy tape measure in hand, I head to my workshop! it doesn't just start out looking like this! It didn’t dawn on me to start taking pictures until I was halfway through with the project, so, there’s not a really clear picture of how my workshop looks when it’s all packed away. Okay, so… again, I was halfway through before I decided to take pictures. 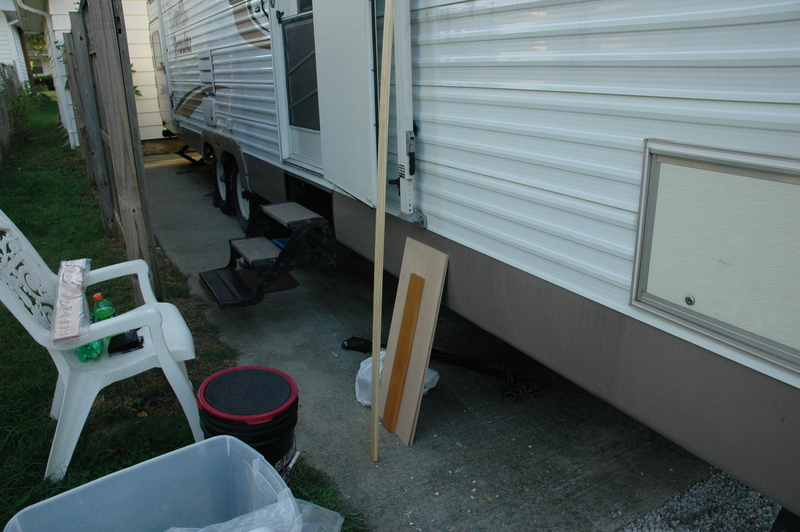 That dark brown piece there is a piece of oak, stained closed to what the trailer’s existing wood is. The long piece is pine, and shelves are cedar. I obviously have no idea what wood to use for what. But, I know people put cedar chips in the closets to keep things smelling nice, so, I thought I’d try to somehow incorporate that into what I was doing. There were three more of the oak pieces that didn’t make it into the picture. I just sort of walked around a Menard’s and let my mind wander. The pine is just a 1×2. The oak boards are supposed to be for drawer sides, and the cedar is supposed to be the door panel on a bathroom cabinet. So, this guy has been my little buddy since I bought it. It’s a Rigid JobMax. It is cordless, comes with several different attachments, and I can even pull the head off and put a drill head on there. 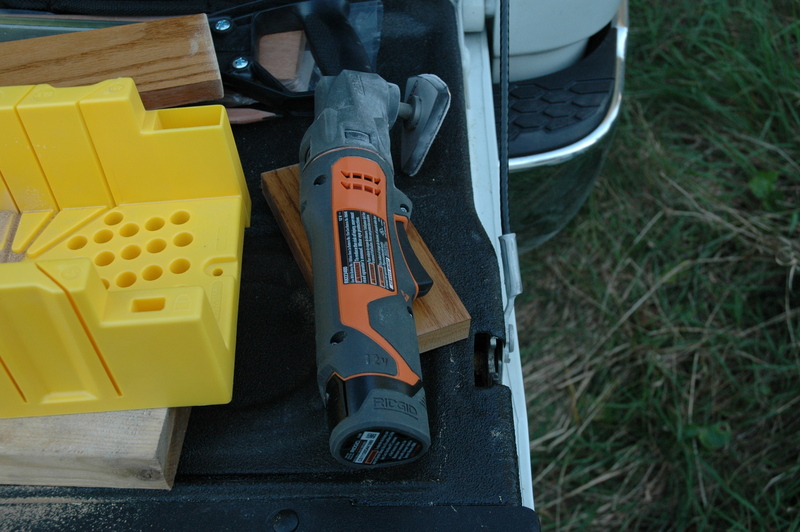 There’s a lot it can do; so far I’ve used it for drilling pilot holes, sanding, and cutting (mostly like a jigsaw). I got a little nervous the first time I ran the battery down, because it doesn’t wind down like my cordless drill (which I didn’t bring). It just… stops. I was immediately angry the first time, because I paid like $120 for it a month ago, and I thought the motor locked up. (this after about six hours of use). 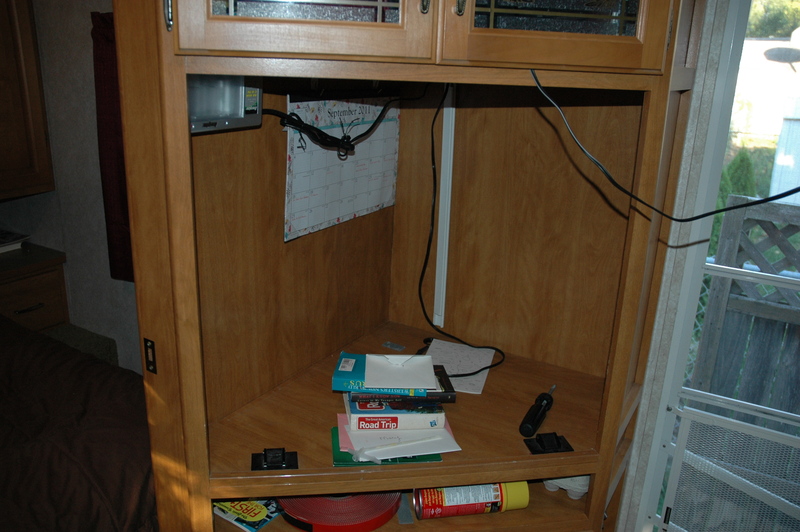 I got huffy and put the battery in the charger, and put everything away for the day. When I got it back out the next morning, it worked just fine again. I saw this thing (maybe not the Rigid) on This Old House, I’m pretty sure, and I’ve wanted one ever since. If you’re looking for a little home fix-it tool, I recommend going to Rigid’s website and checking it out. They have corded models too, but cordless fits our situation much better. I just bought this recently, and it’s pretty self explanatory. Unless you’re REALLY good at cutting straight lines with a hand saw, this thing is nothing short of magical. That black thing sticking up is one of two tensioners to keep your work still and lined up right. 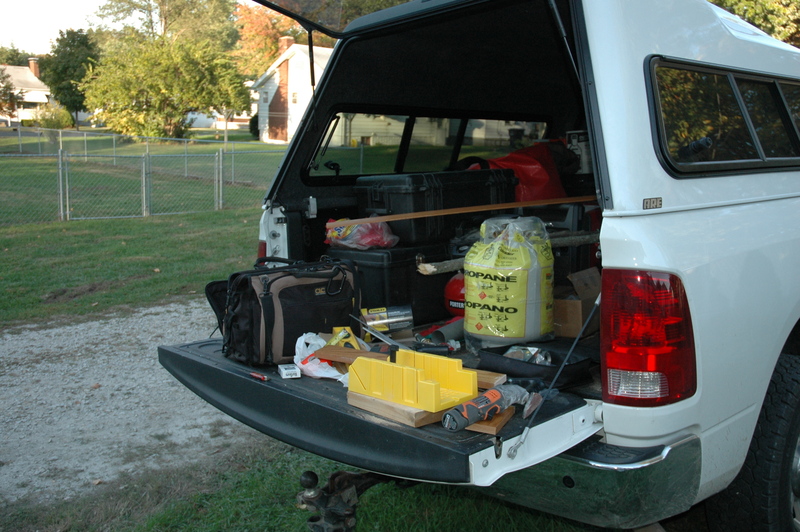 (cutting wood on a tailgate without clamps tends to make your work move as you saw!). It was in the neighborhood of $20, and came with a saw. I’ve also heard (and just started practicing) that when you’re making cuts, that you should score your wood with a razor before cutting. This does a couple of things. If you’re cutting free hand (which I’m not, since I bought this miter box) it helps give your saw a groove to follow right from the beginning. Secondly (and more useful I think), when you cut, the wood almost always kind of splinters when the saw makes the transition from “wood” to “no wood”. (I’m talking about on the back side of what you’re cutting right now). Little chips almost always pop out, and then you have to worry about sanding them smooth, and if you’re cutting pre-stained wood, you’re also now dealing with loosing some of the stained surface. So, you end up with little jagged marks without stain. Scoring the wood with a razor first really helps eliminate those splinters. So, when you’re done cutting, all of the edges are really smooth. You can see from the label, that these aren’t exactly intended for shelf supports. But, wood is wood, and the color matched. 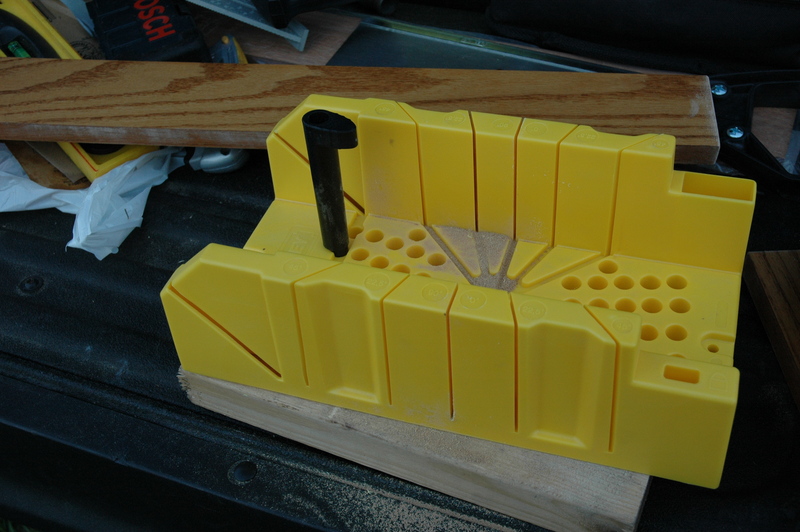 This is a great graphic example of how cool this miter box is. I couldn’t have trimmed that piece off that well if I were doing it free hand. Not in a million years. I took a lot of pictures of this little piece of wood. 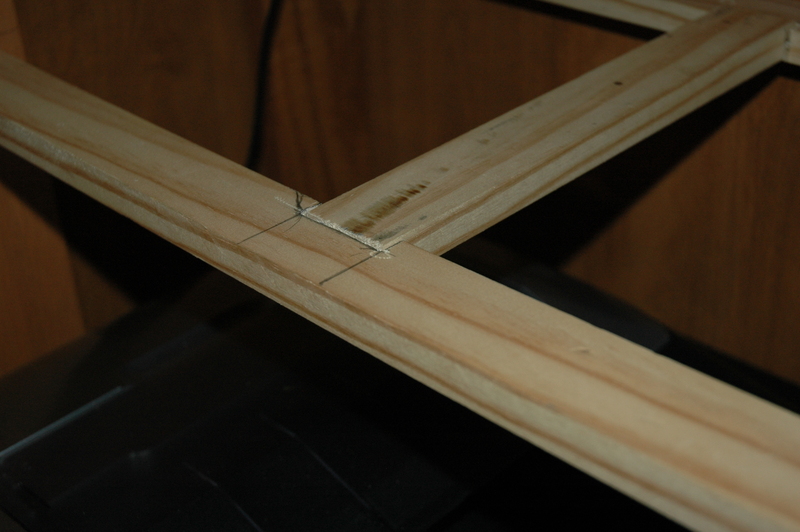 I’m telling you, I was really impressed that I was able to trim it that close. I got a little carried away with the working, and forgot to take pictures of it, so we’re skipping ahead to the fit test. If you zoom in on the pic, you can see that I cut notches in the legs so that I could fit the 1×2’s. 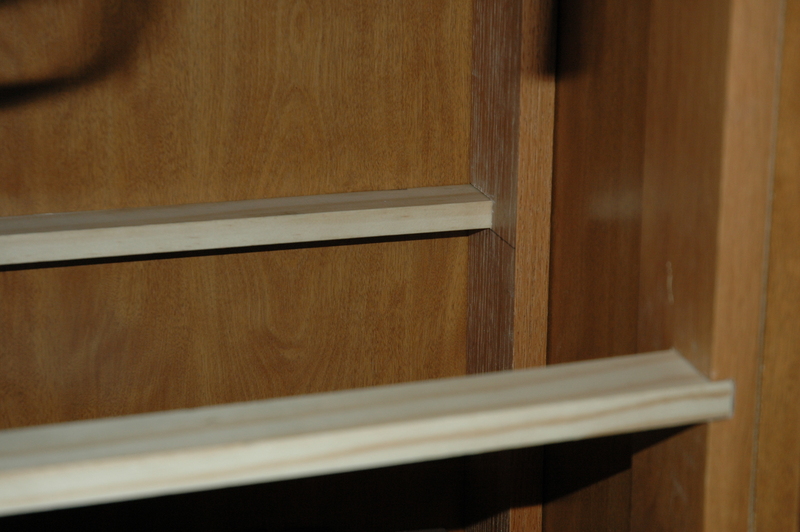 The whole premise behind how I tried to build these shelves is that I have very little structural integrity in the surrounding cabinetry. I couldn’t really nail the supports to the walls they were against, because there’s just no meat there. The walls are like 1/8″ thick panel board. 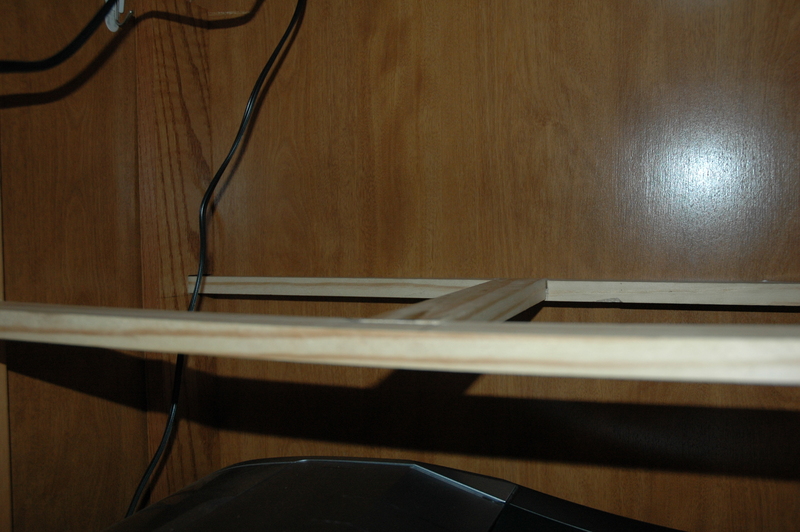 I wanted to fit the legs as tight as possible on the bottom and the top, and hold them still with the horizontal boards. 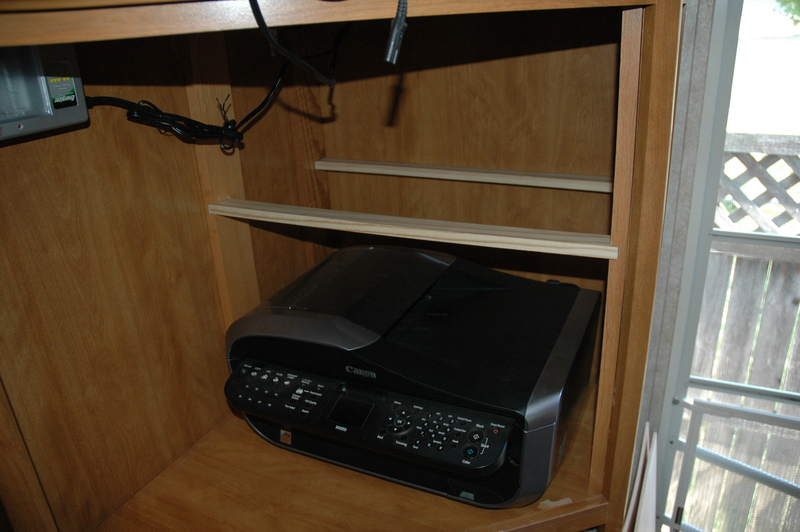 I wanted these shelves to press OUT and hold themselves in place. I cut the back vertical support a little short (got in a hurry and measured wrong) but I figured I could clean it up a little when I put the horizontal boards in. I really didn’t want to go to the hardware store again and get a new board. So, in that pic, you can see some of the tool marks from when I cut out the notch. It ain’t pretty, but, it’s going to be covered, so I wasn’t too worried about it. I taped the blade on my JobMax to match the depth, and cut a series of marks where the notch needed to be. 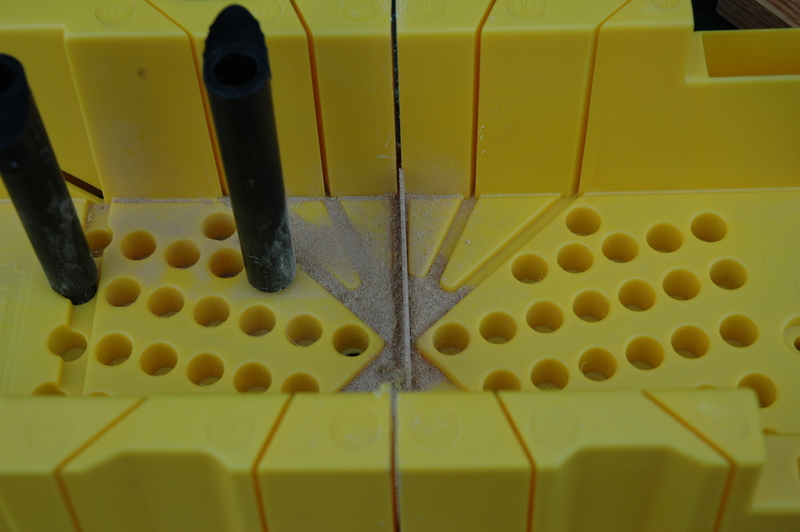 Then I chiseled out what was left, and went back in with the JobMax to clean it up some. I’ve never done this before, and I have very limited tools. I brought a set of wood chisels, but, they’ve been a bit abused, so, they’re a bit jagged in some places. Also, as space is an issue, the only hammer I brought was a 2 lb. sledge for misc. mechanical work on the trailer. So, while I was creating this work of art, it was me, sitting on a five gallon bucket, on a slope, with a jagged chisel, and using a pair of channel locks as a hammer. I had the board propped in my lap, holding it still with the top of my foot and my elbow. So, all in all, I think it turned out pretty good considering the circumstances it was created under! Just wanted to get a shot in of the other side, too. 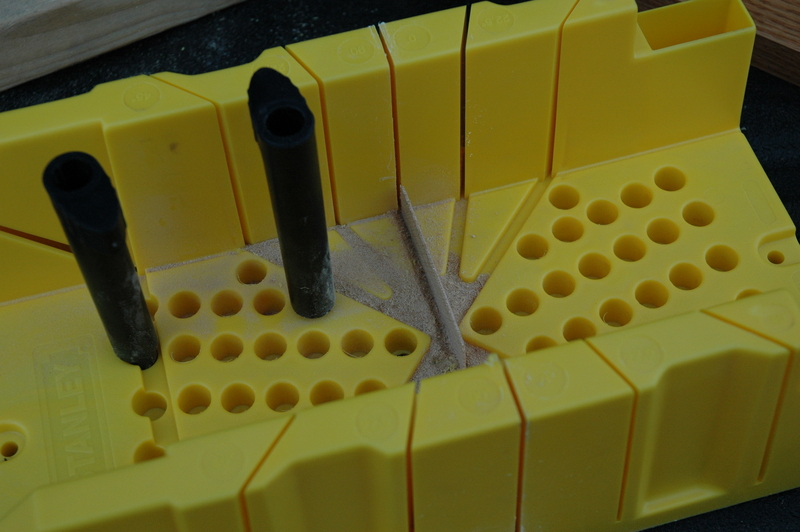 So, here, I went to work again with the JobMax, my crappy chisels and my channel lock/hammer. I cut notches in the crossbar about half the total thickness, and then cut matching notches in the first horizontal supports to match. 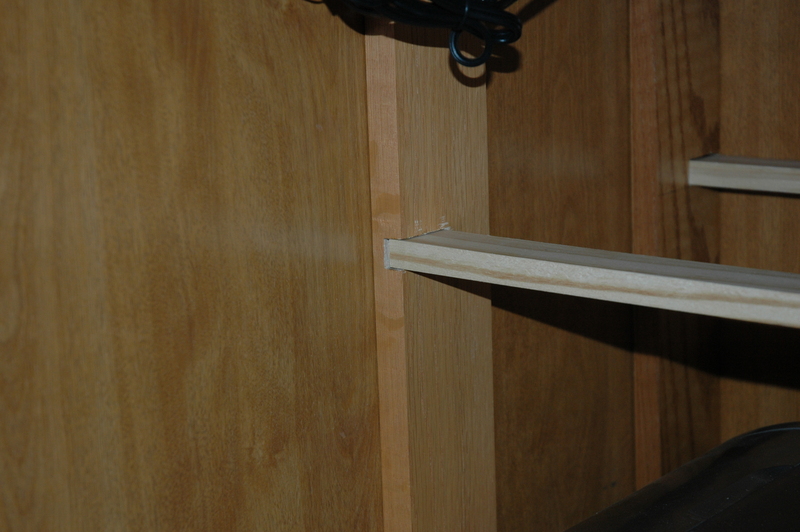 The whole idea here is continuing to make the shelves support themselves, with as little outside materials (nails) as possible. When I was done with this step, the vertical legs were pretty much immobilized. There was still some play laterally, but I brought my hot glue gun, and I already knew exactly how I was going to put it to use here! There it is. That one little corner that didn’t seat all the way. I was close to the enda though, so I decided just to move forward. This is the step where Mary started getting excited. She appreciated the frame work, but, now it was starting to look useful. The panel board was actually a little narrower than I had in my head. 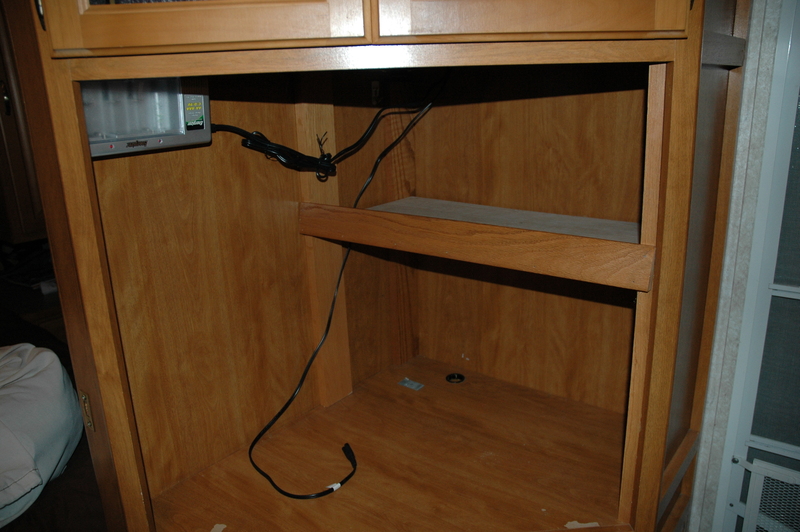 I thought for sure I was going to have to trim it to fit, but it wound up being a little narrower than I planned for. 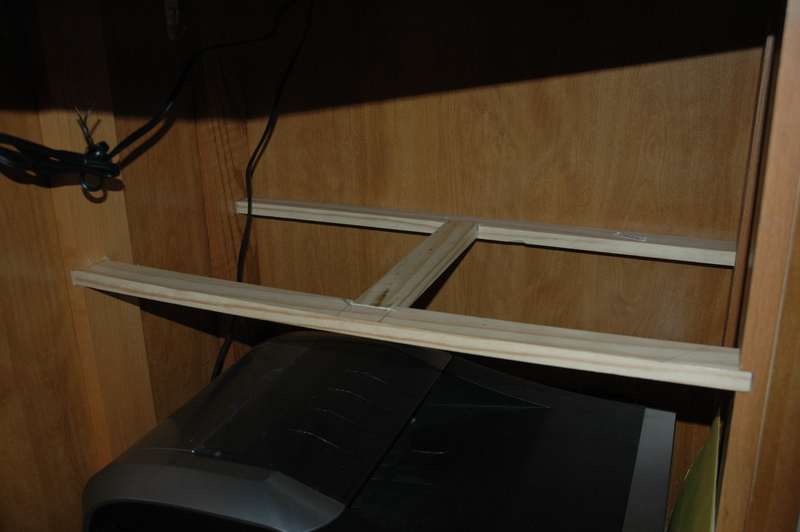 The panel board was supposed to fit all the way from edge to edge of the horizontal supports. It’s still functional, but not really what I wanted. On the leg, you can see where I filled the gap with hot glue (I LOVE my hot glue gun. I should have inscribed “Homer” on this thing – cause it’s the same story. I bought it for Mary, and it’s been in my toolbox ever since!) 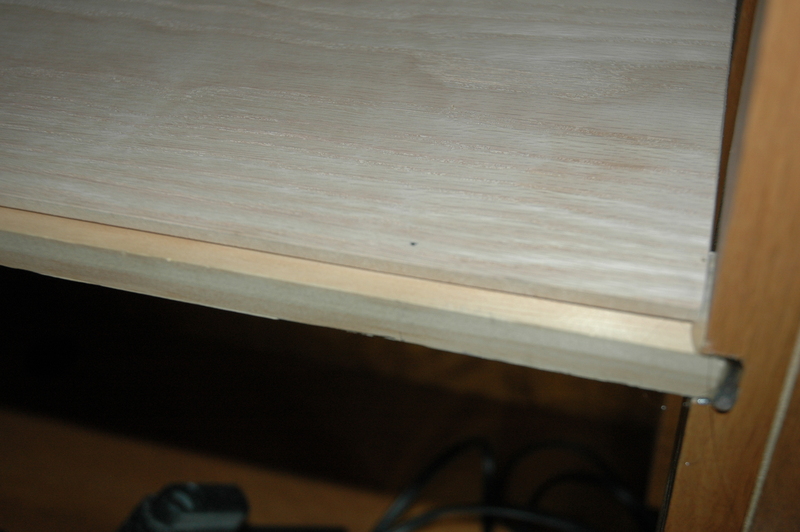 You can also see where I started adding some finishing nails to hold the panel to the supports. This time, I almost had the right tools. I bought some punches to set these nails, but I knew that my channel-lock-hammer was too unstable to use on the punches. So, I got out my other hammer. (my other other hammer). My 3/8″ drive ratchet-hammer. What a fiasco. 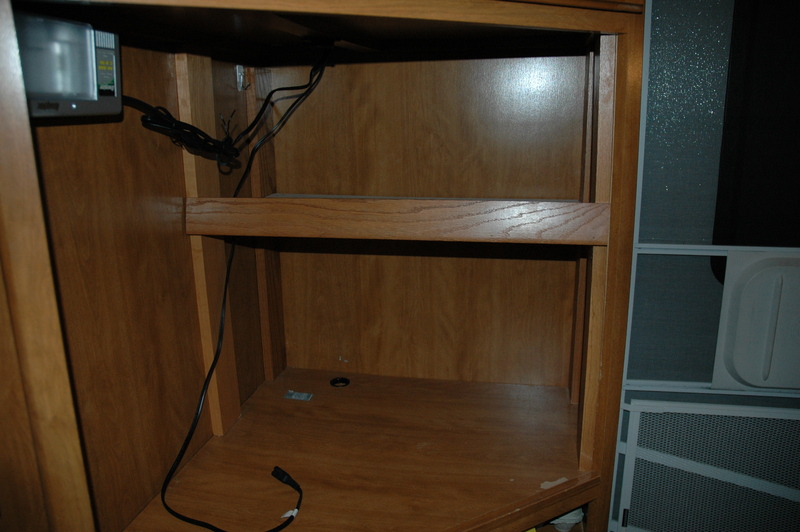 I just realized I don’t have any pictures of what the shelves look like with everything put back into place. I’ll come back later and edit this post so I can show that. It looks pretty good. 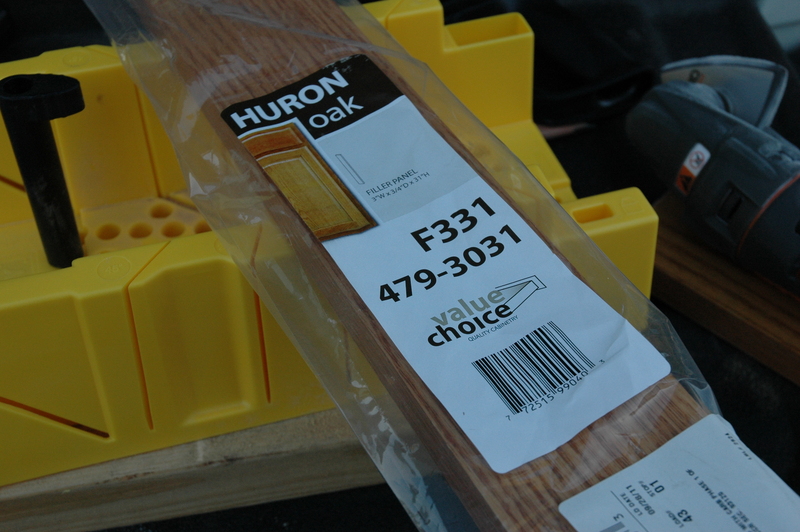 That final piece was a baseboard molding board. Okay, just molding. Apparently, a “molding board” (properly spelled “moulding board” is something to knead dough on). Ha. 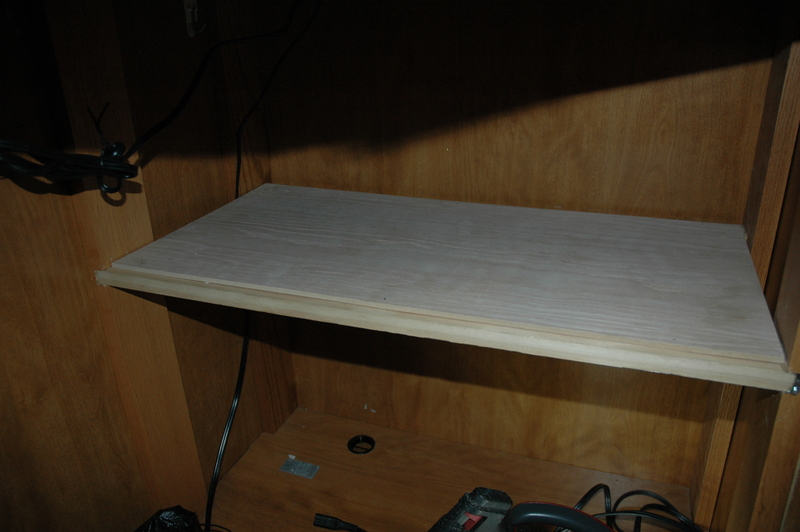 Anyway; it was a piece of baseboard, cut to fit, and pre-stained the right color. It’s not crooked though. It was just the weird angle I took the picture from.